In India, "the Emergency" refers to a 21-month period from 1975 to 1977 when Prime Minister Indira Gandhi had a state of emergency declared across the country. Officially issued by President Fakhruddin Ali Ahmed under Article 352 of the Constitution because of the prevailing "internal disturbance", the Emergency was in effect from 25 June 1975 until its withdrawal on 21 March 1977. The order bestowed upon the Prime Minister the authority to rule by decree, allowing elections to be suspended and civil liberties to be curbed. For much of the Emergency, most of Gandhi's political opponents were imprisoned and the press was censored. Several other human rights violations were reported from the time, including a forced mass-sterilization campaign spearheaded by Sanjay Gandhi, the Prime Minister's son. The Emergency is one of the most controversial periods of independent India's history. Indira is India, India is Indira. Within the Congress, Indira ruthlessly outmanoeuvred her rivals, forcing the party to split in 1969—into the Congress (O) (comprising the old-guard known as the "Syndicate") and her Congress (R). A majority of the All-India Congress Committee and Congress MPs sided with the prime minister. Indira's party was of a different breed from the Congress of old, which had been a robust institution with traditions of internal democracy. In the Congress (R), on the other hand, members quickly realised that their progress within the ranks depended solely on their loyalty to Indira Gandhi and her family, and ostentatious displays of sycophancy became routine. In the coming years, Indira's influence was such that she could install hand-picked loyalists as chief ministers of states, rather than their being elected by the Congress legislative party. Indira's ascent was backed by her charismatic appeal among the masses that was aided by her government's near-radical leftward turns. These included the July 1969 nationalisation of several major banks and the September 1970 abolition of the privy purse; these changes were often done suddenly, via ordinance, to the shock of her opponents. Subsequently, unlike the Syndicate and other opponents, Indira was seen as "standing for socialism in economics and secularism in matters of religion, as being pro-poor and for the development of the nation as a whole." The prime minister was especially adored by the disadvantaged sections—the poor, Dalits, women and minorities. For them, she was their Indira Amma, a personification of Mother Indira. In the 1971 general elections, the people rallied behind Indira's populist slogan of Garibi Hatao! (abolish poverty!) to award her a huge majority (352 seats out of 518). "By the margin of its victory," historian Ramachandra Guha later wrote, Congress (R) came to be known as the real Congress, "requiring no qualifying suffix." In December 1971, under her proactive war leadership, India routed arch-enemy Pakistan in a war that led to the independence of Bangladesh, formerly East Pakistan. Awarded the Bharat Ratna the next month, she was at her greatest peak; for her biographer Inder Malhotra, "The Economist's description of her as the 'Empress of India' seemed apt." Even opposition leaders, who routinely accused her of being a dictator and of fostering a personality cult, referred to her as Durga, a Hindu goddess. In 1967's Golaknath case, the Supreme Court said that the Constitution could not be amended by Parliament if the changes affect basic issues such as fundamental rights. To nullify this judgement, Parliament dominated by the Indira Gandhi Congress, passed the 24th Amendment in 1971. Similarly, after the government lost a Supreme Court case for withdrawing the privy purse given to erstwhile princes, Parliament passed the 26th Amendment. This gave constitutional validity to the government's abolition of the privy purse and nullified the Supreme Court's order. This judiciary–executive battle would continue in the landmark Kesavananda Bharati case, where the 24th Amendment was called into question. With a wafer-thin majority of 7 to 6, the bench of the Supreme Court restricted Parliament's amendment power by stating it could not be used to alter the "basic structure" of the Constitution. Subsequently, Prime Minister Gandhi made A. N. Ray—the senior most judge amongst those in the minority in Kesavananda Bharati—Chief Justice of India. Ray superseded three judges more senior to him—J. M. Shelat, K. S. Hegde and Grover—all members of the majority in Kesavananda Bharati. Indira Gandhi's tendency to control the judiciary met with severe criticism, both from the press and political opponents such as Jayaprakash Narayan ("JP"). During 1973–75, political unrest against the Indira Gandhi government increased across the country. This led some Congress party leaders to demand a move towards a presidential system emergency declaration with a more powerful directly elected executive. The most significant of the initial such movement was the Nav Nirman movement in Gujarat, between December 1973 and March 1974. Student unrest against the state's education minister ultimately forced the central government to dissolve the state legislature, leading to the resignation of the chief minister, Chimanbhai Patel, and the imposition of President's rule. After the re-elections in June 1977, Gandhi's party was defeated by the Janata alliance, formed by parties opposed to the ruling Congress party. Meanwhile there were assassination attempts on public leaders as well as the assassination of the railway minister L. N. Mishra by a bomb. All of these indicated a growing law and order problem in the entire country, which Mrs. Gandhi's advisors warned her of for months. In March–April 1974, a student agitation by the Bihar Chatra Sangharsh Samiti received the support of Gandhian socialist Jayaprakash Narayan, referred to as JP, against the Bihar government. In April 1974, in Patna, JP called for "total revolution," asking students, peasants, and labour unions to non-violently transform Indian society. He also demanded the dissolution of the state government, but this was not accepted by Centre. A month later, the railway-employees union, the largest union in the country, went on a nationwide railways strike. This strike was brutally suppressed by the Indira Gandhi government, which arrested thousands of employees and drove their families out of their quarters. Raj Narain, who had been defeated in the 1971 parliamentary election by Indira Gandhi, lodged cases of election fraud and use of state machinery for election purposes against her in the Allahabad High Court. Shanti Bhushan fought the case for Narain. Indira Gandhi was also cross-examined in the High Court which was the first such instance for an Indian Prime Minister. On 12 June 1975, Justice Jagmohanlal Sinha of the Allahabad High Court found the prime minister guilty on the charge of misuse of government machinery for her election campaign. The court declared her election null and void and unseated her from her seat in the Lok Sabha. The court also banned her from contesting any election for an additional six years. Serious charges such as bribing voters and election malpractices were dropped and she was held responsible for misusing government machinery, and found guilty on charges such as using the state police to build a dais, availing herself of the services of a government officer, Yashpal Kapoor, during the elections before he had resigned from his position, and use of electricity from the state electricity department. Because the court unseated her on comparatively frivolous charges, while she was acquitted on more serious charges, The Times described it as "firing the Prime Minister for a traffic ticket". Her supporters organized mass pro-Indira demonstrations in the streets of Delhi close to the Prime Minister's residence. The persistent efforts of Narain were praised worldwide as it took over four years for Justice Sinha to pass judgement against the prime minister. Indira Gandhi challenged the High Court's decision in the Supreme Court. Justice V. R. Krishna Iyer, on 24 June 1975, upheld the High Court judgement and ordered all privileges Gandhi received as an MP be stopped, and that she be debarred from voting. However, she was allowed to continue as Prime Minister pending the resolution of her appeal. JP Narayan and Morarji Desai called for daily anti-government protests. The next day, JP organised a large rally in Delhi, where he said that a police officer must reject the orders of government if the order is immoral and unethical as this was Mahatma Gandhi's motto during the freedom struggle. Such a statement was taken as a sign of inciting rebellion in the country. Later that day, Indira Gandhi requested a compliant President Fakhruddin Ali Ahmed to issue a proclamation of a state of emergency. Within three hours, the electricity to all major newspapers was cut and the political opposition arrested. The proposal was sent without discussion with the Union Cabinet, who only learnt of it and ratified it the next morning. The Government cited threats to national security, as a war with Pakistan had recently been concluded. Due to the war and additional challenges of drought and the 1973 oil crisis, the economy was in poor condition. The Government claimed that the strikes and protests had paralysed the government and hurt the economy of the country greatly. In the face of massive political opposition, desertion and disorder across the country and the party, Gandhi stuck to the advice of a few loyalists and her younger son Sanjay Gandhi, whose own power had grown considerably over the last few years to become an "extra-constitutional authority". Siddhartha Shankar Ray, the Chief Minister of West Bengal, proposed to the prime minister to impose an "internal emergency". He drafted a letter for the President to issue the proclamation on the basis of information Indira had received that "there is an imminent danger to the security of India being threatened by internal disturbances". He showed how democratic freedom could be suspended while remaining within the ambit of the Constitution. After a quick question regarding a procedural matter, President Fakhruddin Ali Ahmed declared a state of internal emergency upon the prime minister's advice on the night of 25 June 1975, just a few minutes before the clock struck midnight. As the constitution requires, Mrs. Gandhi advised and President Ahmed approved the continuation of Emergency over every six-month period until her decision to hold elections in 1977. Indira Gandhi devised a '20-point' economic programme to increase agricultural and industrial production, improve public services and fight poverty and illiteracy, through "the discipline of the graveyard". In addition to the official twenty points, Sanjay Gandhi declared his own five-point programme promoting literacy, family planning, tree planting, the eradication of casteism and the abolition of dowry. Later during the Emergency, the two projects merged into a twenty-five point programme. In Tamil Nadu, the M. Karunanidhi government was dissolved and the leaders of the DMK were incarcerated. In particular, Karunanidhi's son M. K. Stalin, was arrested under the Maintenance of Internal Security Act. At least nine High Courts pronounced that even after the declaration of an emergency, a person could challenge his detention. The Supreme Court, now under the Indira Gandhi-appointed Chief Justice A. N. Ray, overruled all of them, upholding the state's plea for power to detain a person without the necessity of informing him of the grounds for his arrest, or to suspend his personal liberties, or to deprive him of his right to life, in an absolute manner (the habeas corpus case'). Many political workers who were not arrested in the first wave, went 'underground' continuing organising protests. Cases like Baroda dynamite case and Rajan case became exceptional examples of atrocities committed against civilians in independent India. If the Indian constitution is our heritage bequeathed to us by our founding fathers, no less are we, the people of India, the trustees and custodians of the values which pulsate within its provisions! A constitution is not a parchment of paper, it is a way of life and has to be lived up to. Eternal vigilance is the price of liberty and in the final analysis, its only keepers are the people. Imbecility of men, history teaches us, always invites the impudence of power. In the Rajan case, P. Rajan of the Regional Engineering College, Calicut, was arrested by the police in Kerala on 1 March 1976, tortured in custody until he died and then his body was disposed of and was never recovered. The facts of this incident came out owing to a habeas corpus suit filed in the Kerala High Court. In September 1976, Sanjay Gandhi initiated a widespread compulsory sterilization programme to limit population growth. The exact extent of Sanjay Gandhi's role in the implementation of the programme is disputed, with some writers holding Gandhi directly responsible for his authoritarianism, and other writers blaming the officials who implemented the programme rather than Gandhi himself. Rukhsana Sultana was a socialite known for being one of Sanjay Gandhi's close associates and she gained a lot of notoriety in leading Sanjay Gandhi's sterilisation campaign in Muslim areas of old Delhi. The campaign primarily involved getting males to undergo vasectomy. Quotas were set up that enthusiastic supporters and government officials worked hard to achieve. There were allegations of coercion of unwilling candidates too. In 1976–1977, the programme led to 8.3 million sterilisations, most of them forced, up from 2.7 million the previous year. The bad publicity led every government since 1977 to stress that family planning is entirely voluntary. Kartar, a cobbler, was taken to a Block Development Officer (BDO) by six policemen, where he was asked how many children he had. He was forcefully taken for sterilisation in a jeep. En route, the police forced a man on the bicycle into the jeep because he was not sterilised. Kartar had an infection and pain because of the procedure and could not work for months. Shahu Ghalake, a peasant from Barsi in Maharashtra, was taken for sterilization. After mentioning that he was already sterilised, he was beaten. A sterilisation procedure was undertaken on him for a second time. Hawa Singh, a young widower, from Pipli was taken from the bus against his will and sterilised. The infection took his life. Harijan, a 70-year-old with no teeth and bad eyesight, was sterilized forcefully. Uttawar, a village 80 kilometres south of Delhi, woke up to the police loudspeakers at 03:00. Police gathered 400 men at the bus stop. In the process of finding more villagers, police broke into homes and looted. Total of 800 forced sterilisations were done. In Muzaffarnagar, Uttar Pradesh, on 18 October 1976, police picked up 17 people, nine Hindu and eight Muslims out of which two were over 75 and two under 18. Hundreds of Hindus and Muslims surrounded the police station demanding to free captives. The police refused to release them and used tear gas shells. Crowd retaliated by throwing stones and to control the situation, the police fired on the crowd. 30 people died as a result. During the Emergency, Sanjay Gandhi asked the popular singer Kishore Kumar to sing for a Congress party rally in Bombay, but he refused. As a result, Information and broadcasting minister Vidya Charan Shukla put an unofficial ban on playing Kishore Kumar songs on state broadcasters All India Radio and Doordarshan from 4 May 1976 till the end of Emergency. Destruction of the slum and low-income housing in the Turkmen Gate and Jama Masjid area of old Delhi. Large-scale and illegal enactment of laws (including modifications to the Constitution). The Emergency years were the biggest challenge to India's commitment to democracy, which proved vulnerable to the manipulation of powerful leaders and hegemonic Parliamentary majorities. Rashtriya Swayamsevak Sangh, which was seen close to opposition leaders, and with its large organisational base was seen as having the potential of organising protests against the Government, was also banned. Police clamped down on the organisation and thousands of its workers were imprisoned. The RSS defied the ban and thousands participated in Satyagraha (peaceful protests) against the ban and against the curtailment of fundamental rights. Later, when there was no letup, the volunteers of the RSS formed underground movements for the restoration of democracy. Literature that was censored in the media was clandestinely published and distributed on a large scale and funds were collected for the movement. Networks were established between leaders of different political parties in the jail and outside for the co-ordination of the movement. The Economist described the movement as "the only non-left revolutionary force in the world". It said that the movement was "dominated by tens of thousands of RSS cadres, though more and more young recruits are coming". Talking about its objectives it said "its platform at the moment has only one plank: to bring democracy back to India". The claims of RSS leaders have been contested by political scientist Professor DL Sheth saying that these organisations have never borne the brunt Indira's oppressive regime. The RSS projects itself as the champion of anti-Emergency struggle but it was in fact, it's only lifeline. In a 2000 Hindu daily article, Dr. Subramanian Swamy had alleged that several Sangh leaders were hobnobbing with Indira. He added that the Sangh, at the instance of Vajpayee, even went further to sign a peace accord with Indira Gandhi. Shortly after the declaration of the Emergency, the Sikh leadership convened meetings in Amritsar where they resolved to oppose the "fascist tendency of the Congress". The first mass protest in the country, known as the "Campaign to Save Democracy" was organised by the Akali Dal and launched in Amritsar, 9 July. A statement to the press recalled the historic Sikh struggle for freedom under the Mughals, then under the British, and voiced concern that what had been fought for and achieved was being lost. The police were out in force for the demonstration and arrested the protestors, including the Shiromani Akali Dal and Shiromani Gurdwara Prabandhak Committee (SGPC) leaders. The question before us is not whether Indira Gandhi should continue to be prime minister or not. The point is whether democracy in this country is to survive or not. According to Amnesty International, 140,000 people had been arrested without trial during the twenty months of Gandhi's Emergency. Jasjit Singh Grewal estimates that 40,000 of them came from India's two percent Sikh minority. On 18 January 1977, Gandhi called fresh elections for March and released all political prisoners though the Emergency officially ended on 23 March 1977. The opposition Janata movement's campaign warned Indians that the elections might be their last chance to choose between "democracy and dictatorship." In the Lok Sabha elections, held in March, Mrs. Gandhi and Sanjay both lost their Lok Sabha seats, as did all the Congress Candidates in Northern states such as Bihar and Uttar Pradesh. Many Congress Party loyalists deserted Mrs. Gandhi. The Congress was reduced to just 153 seats, 92 of which were from four of the southern states. The Janata Party's 298 seats and its allies' 47 seats (of a total 542) gave it a massive majority. Morarji Desai became the first non-Congress Prime Minister of India. Voters in the electorally largest state of Uttar Pradesh, historically a Congress stronghold, turned against Gandhi and her party failed to win a single seat in the state. Dhanagare says the structural reasons behind the discontent against the Government included the emergence of a strong and united opposition, disunity and weariness inside Congress, an effective underground opposition, and the ineffectiveness of Gandhi's control of the mass media, which had lost much credibility. The structural factors allowed voters to express their grievances, notably their resentment of the emergency and its authoritarian and repressive policies. One grievance often mentioned as the 'nasbandi' (vasectomy) campaign in rural areas. The middle classes also emphasised the curbing of freedom throughout the state and India. Meanwhile, Congress hit an all-time low in West Bengal because of the poor discipline and factionalism among Congress activists as well as the numerous defections that weakened the party. Opponents emphasised the issues of corruption in Congress and appealed to a deep desire by the voters for fresh leadership. The efforts of the Janata administration to get government officials and Congress politicians tried for Emergency-era abuses and crimes were largely unsuccessful due to a disorganised, over-complex and politically motivated process of litigation. The Thirty-eighth Amendment of the Constitution of India, put in place shortly after the outset of the Emergency and which among other things prohibited judicial reviews of states of emergencies and actions taken during them, also likely played a role in this lack of success. Although special tribunals were organised and scores of senior Congress Party and government officials arrested and charged, including Mrs. Gandhi and Sanjay Gandhi, police were unable to submit sufficient evidence for most cases, and only a few low-level officials were convicted of any abuses. The people lost interest in the hearings owing to their continuous fumbling and complex nature, and the economic and social needs of the country grew more important to them. Democracy, beloved husband of Truth, loving father of Liberty, brother of Faith, Hope and Justice, expired on June 26. A few days later censorship was imposed on newspapers. The Delhi edition of the Indian Express on 28 June, carried a blank editorial, while the Financial Express reproduced in large type Rabindranath Tagore's poem "Where the mind is without fear". However, the Emergency also received support from several sections. It was endorsed by social reformer Vinoba Bhave (who called it Anushasan parva, a time for discipline), industrialist J. R. D. Tata, writer Khushwant Singh, and Indira Gandhi's close friend and Orissa Chief Minister Nandini Satpathy. However, Tata and Satpathy later regretted that they spoke in favour of the Emergency. Others have argued that Gandhi's Twenty Point Programme increased agricultural production, manufacturing activity, exports and foreign reserves. Communal Hindu–Muslim riots, which had resurfaced in the 1960s and 1970s, also reduced in intensity. In the book JP Movement and the Emergency, historian Bipan Chandra wrote, "Sanjay Gandhi and his cronies like Bansi Lal, Minister of Defence at the time, were keen on postponing elections and prolonging the emergency by several years ... In October–November 1976, an effort was made to change the basic civil libertarian structure of the Indian Constitution through the 42nd amendment to it. ... The most important changes were designed to strengthen the executive at the cost of the judiciary, and thus disturb the carefully crafted system of Constitutional checks and balance between the three organs of the government." Writer Rahi Masoom Raza criticised the Emergency through his novel Qatra bi Aarzoo. Shashi Tharoor portrays the Emergency allegorically in his The Great Indian Novel(1989), describing it as "The Siege". He also authored a satirical play on the Emergency, Twenty-Two Months in the Life of a Dog, that was published in his The Five-Dollar Smile and Other Stories. A Fine Balance and Such a Long Journey by Rohinton Mistry take place during the Emergency and highlight many of the abuses that occurred during that period, largely through the lens of India's small but culturally influential Parsi minority. Booker Prize-winner Midnight's Children by Salman Rushdie, has the protagonist, Saleem Sinai, in India during the Emergency. His home in a low income area, called the "magician's ghetto", is destroyed as part of the national beautification program. He is forcibly sterilised as part of the vasectomy program. The principal antagonist of the book is "the Widow" (a likeness that Indira Gandhi successfully sued Rushdie for). There was one line in the book that repeated an old Indian rumour that Indira Gandhi's son didn't like his mother because he suspected her of causing the death of his father. As this was a rumour; there was no substantiation to be found. India: A Wounded Civilization, a book by V S Naipaul is also oriented around Emergency. The Plunge An English novel by Sanjeev Tare is their own story told by four youths studying at Kalidas College in Nagpur. They tell the reader what they went through during those politically turbulent times. The Malayalam novel Delhi Gadhakal (Tales from Delhi) by M. Mukundan highlights many abuses that occurred during the Emergency including forced sterilization of men and the destruction of houses and shops owned by Muslims in Turkmen Gate. Brutus, You!, a book by Chanakya Sen is based on internal politics of Jawaharlal Nehru University, Delhi during the period of Emergency. Vasansi Jirnani, a play by Torit Mitra is inspired by Ariel Dorfman's Death and the Maiden and effects of emergency. The Tamil novel Marukkozhunthu Mangai (Girl with Fragrant Chinese Mugwort ) by Ra. Su. Nallaperumal which is based on the history of Pallavas & People's rising in Kanchi during 725 A.D explains how the widow Queen and the Princess kill the freedom of the people. Most of the incidents described in the novel resemble the emergency period. Even the name of the characters in the novel are similar to Mrs Gandhi and her family. The Malayalam autobiographical diary by political activist R.C. Unnithan penned while the author was imprisoned as a political prisoner during emergency under MISA for sixteen months at Poojappura state prison in Thiruvananthapuram, Kerala, gives a personal account of his travails during the dark days of Indian democracy. In 2001's Life of Pi, Pi's father decides to sell the zoo and move his family to Canada, around the same time of the Emergency. Gulzar's Aandhi (1975) was banned, because the film was supposedly based on Indira Gandhi. Amrit Nahata's film Kissa Kursi Ka (1977) a bold spoof on the Emergency, where Shabana Azmi plays 'Janata' (the public) a mute, dumb protagonist, was subsequently banned and reportedly, all its prints were burned by Sanjay Gandhi and his associates at his Maruti factory in Gurgaon. Yamagola a 1977 Telugu film (Hindi re-make Lok Parlok) spoofs the emergency issues. I. S. Johar's 1978 Bollywood Film Nasbandi is a sarcasm on the sterilization drive of the Government of India, where each one of the characters is trying to find sterilization cases. The film was banned after its release due to its portrayal of the Indira Gandhi government. Although Satyajit Ray's 1980 film Hirak Rajar Deshe was a children's comedy, it was a satire on the Emergency. The 1985 Malayalam film Yathra directed by Balu Mahendra has the human rights violations by the police during the Emergency as its main plotline. 1988 Malayalam film Piravi is about a father searching for his son Rajan, who had been arrested by the police (and allegedly killed in custody). The 2005 Hindi film Hazaaron Khwaishein Aisi is set against the backdrop of the Emergency. The film, directed by Sudhir Mishra, also tries to portray the growth of the Naxalite movement during the Emergency era. The movie tells the story of three youngsters in the 1970s, when India was undergoing massive social and political changes. The 2012 Marathi film Shala discusses the issues related to the Emergency. The critically acclaimed 2012 film adaptation, Life of Pi, uses the Emergency as the backdrop of which Pi's father decides to sell the zoo and move his family to Canada. Midnight's Children, a 2012 adaptation of Rushdie's novel, created widespread controversy due to the negative portrayal of Indira Gandhi and other leaders. The film was not shown at the International Film Festival of India and was banned from further screening at the International Film Festival of Kerala where it was premièred in India. Indu Sarkar, 2017 Hindi political thriller film about the emergency, directed by Madhur Bhandarkar. 21 Months of Hell, documentary film about the torture methods performed by the police. ^ "Interview with Indira Gandhi". Interview relecast through India times. TV Eye. Retrieved 14 June 2018. ^ "recallign the emergency". Indian Express. 29 June 2015. Retrieved 14 June 2018. ^ Hellmann-Rajanayagam, Dagmar (2013). "The Pioneers: Durga Amma, The Only Man In The Cabinet". In Derichs, Claudia; Thompson, Mark R. Dynasties and Female Political Leaders in Asia: Gender, Power and Pedigree. ISBN 978-3-643-90320-4. Retrieved 20 October 2015. ^ Puri, Balraj (1993). "Indian Muslims since Partition,". Economic and Political Weekly. 28 (40): 2141–2149. JSTOR 4400229. ^ Doshi, Vidhi (9 March 2017). "Indira Jaising: "In India, you can't even dream of equal justice. Not at all"". The Guardian. The Guardian. Retrieved 7 May 2017. ^ "Justice Sinha, who set aside Indira Gandhi's election, dies at 87". The Indian Express. 22 March 2008. Archived from the original on 9 March 2012. Retrieved 5 July 2009. ^ Katherine Frank (2001). Indira: The Life of Indira Nehru Gandhi. HarperCollins. pp. 372–373. ISBN 0-00-255646-4. ^ "Indian Emergency of 1975-77". Mount Holyoke College. Retrieved 2009-07-05. ^ "The Rise of Indira Gandhi". Library of Congress Country Studies. Retrieved 2009-06-27. ^ NAYAR, KULDIP (25 June 2000). Yes, Prime Minister Archived 11 February 2010 at the Wayback Machine. The Indian Express. ^ Tarlo, Emma (2001). Unsettling memories : narratives of the emergency in Delhi. University of California Press. pp. 27–28. ISBN 0-520-23122-8. Retrieved 28 June 2016. ^ Today, India. "Arun Jaitley: From Prison to Parliament". ^ Malgonkar, Manohar (1987). The Last Maharani of Gwalior: An Autobiography By Manohar Malgonkar. pp. 233, 242–244. ISBN 9780887066597. ^ Austin, Granville (1999). Working a Democratic Constitution - A History of the Indian Experience. New Delhi: Oxford University Press. p. 320. ISBN 019565610-5. ^ H. R. Khanna. Making of India's Constitution. Eastern Book Co, Lucknow, 1981. ISBN 978-81-7012-108-4. ^ "The case that saved Indian democracy". The Hindu (24 April 2013). Retrieved 4 September 2013. ^ PUCL Archives, Oct 1981, Rajan. ^ Rediff.com, Report dated 26 June 2000. ^ "Fresh probe in Rajan case sought ". The Hindu, 25 January 2011. ^ Vinay Lal. "Indira Gandhi". Retrieved 1 August 2013. Sanjay Gandhi, started to run the country as though it were his personal fiefdom, and earned the fierce hatred of many whom his policies had victimised. He ordered the removal of slum dwellings, and in an attempt to curb India's growing population, initiated a highly resented programme of forced sterilisation. ^ Kumkum Chadha (4 January 2011). "Sanjay's men and women". Retrieved 1 August 2013. The Congress, on the other hand, charges Sanjay Gandhi of "over enthusiasm" in dealing with certain programmes and I quote yet again: "Unfortunately, in certain spheres, over enthusiasm led to compulsion in enforcement of certain programmes like compulsory sterilisation and clearance of slums. Sanjay Gandhi had by then emerged as a leader of great significance.". ^ "Sanjay Gandhi worked in an authoritarian manner: Congress book". 28 December 2010. Retrieved 1 August 2013. ^ India: The Years of Indira Gandhi. Brill Academic Pub. 1988. ^ "Tragedy at Turkman Gate: Witnesses recount horror of Emergency". ^ "Those were the days". ^ "THE NIGHT OF THE LONG KNIVES". ^ a b c d e f Mehta, Vinod (1978). The Sanjay Story. Harper Collins Publishers India. ^ Vinay Kumar (19 August 2005). "The spark that he was". Entertainment Hyderabad. The Hindu. Retrieved 2007-07-13. ^ M.R. Masani, "India's Second Revolution," Asian Affairs (1977) 5#1 pp 19–38. ^ Joseph, Manu (20 May 2007). "How Indians Protest." The Times of India (timesofindia.indiatimes.com). Retrieved 10 November 2018. ^ Austin, Granville (1999). Working a democratic constitution: the Indian experience. Oxford University Press. p. 295. ISBN 0-19-564888-9. ^ "Emergency: The Darkest Period in Indian Democracy". The Viewspaper (Editorial). Retrieved 12 July 2013. ^ Beyond the Last Blue Mountain - A Life of J.R.D. Tata by R. M. Lala. ^ Nandini Satpathy (in Oriya) by Ashisa Ranjan Mohapatra. ^ "New book flays Indira Gandhi's decision to impose Emergency". IBN Live News. 30 May 2011. Archived from the original on 23 November 2013. Retrieved 23 November 2013. ^ O. P. Mathur. Indira Gandhi and the emergency as viewed in the Indian novel. Sarup & Sons. 2004. ISBN 978-81-7625-461-8. ^ Joseph Bendaña. "Rushdie Talk Recasts Role of Public and Private in Politics and Literature". Watson Institute, Brown University. 17 February 2010. ^ Nixon, Rob (1992). "India:+A+Wounded+Civilization"+naipaul+emergency&ots=RqQJjZu1_d&sig=N7kxWg-3yrWq-jEUTGaa2gHei0Q#v=onepage&q=%22India%3A%20A%20Wounded%20Civilization%22%20naipaul%20emergency&f=false London calling : V.S. Naipaul, postcolonial Mandarin. New York u.a. : Oxford Univ. Press. p. 73. ISBN 9780195067170. ^ Gulzar; Nihalani, Govind; Chatterjee, Saibal (2003). Encyclopaedia of Hindi Cinema. New Delhi, Mumbai: Encyclopædia Britannica (India), Popular Prakashan. p. 425. ISBN 81-7991-066-0. Atul Kohli. Democracy and Discontent: India's Growing Crisis of Governability. Cambridge University Press. 1991. ISBN 0-521-39161-X. Atul Kohli (ed.). The Success of India's Democracy. Cambridge University Press. 2001 . ISBN 81-7596-107-4. B. G. Verghese. Warrior of the Fourth Estate: Ramnath Goenka of the Express. Viking, Penguin India. 2005. ISBN 978-0-67005-842-6. Bipan Chandra et al. India Since Independence. Penguin India. 2008 [2011 digital edition]. e-ISBN 978-81-8475-053-9. Durga Das Basu. Introduction to the Constitution of India. LexisNexis Butterworths. 1960 [20th edition, 2011 reprint]. ISBN 978-81-8038-559-9. Inder Malhotra. Indira Gandhi: A Personal and Political Biography. Hodder and Stoughton. 1989. ISBN 0-340-40540-6. Mary C. Carras. 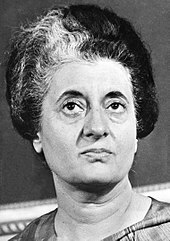 Indira Gandhi: In the Crucible of Leadership. Jaico Publishing House. 1979 . Partha Chatterjee. Lineages of Political Society. Permanent Black. 2011. ISBN 81-7824-317-2. Partha Chatterjee. Empire and Nation: Essential Writings, 1985–2005. Permanent Black. 2010. ISBN 81-7824-267-2. Ramachandra Guha. India After Gandhi: The History of the World's Largest Democracy. HarperCollins. 2008. ISBN 978-0-330-50554-3. S. S. Gill. The Dynasty: A Political Biography of the Premier Ruling Family of Modern India. HarperCollins. 1996. ISBN 81-7223-245-4. Subhash C. Kashyap. Indian Constitution: Conflicts and Controversies. Vitasta Publishing. 2010. ISBN 978-81-89766-41-2. T. V. Sathyamurthy. State and Nation in the Context of Social Change. Oxford University Press. 1994. ISBN 0-19-563136-6. Advani, L. K. (2002). A prisoner's scrap-book. New Delhi: Ocean Books. Kuldip Nayar. The Judgement: Inside Story of the Emergency in India. 1977. Vikas Publishing House. ISBN 0-7069-0557-1. Malkani, K. R. (1978). The midnight knock. New Delhi: Vikas Pub. House. Shourie, Arun (1984). Mrs Gandhi's second reign. New Delhi: Vikas. Shourie, Arun (1978). Symptoms of fascism. New Delhi: Vikas. Sahasrabuddhe, P. G., & Vājapeyī, M. (1991). The people versus emergency: A saga of struggle. New Delhi: Suruchi Prakashan.